The Institute supported the 1990 Kevin McKiernan film The Spirit of Crazy Horse. And again, this summer, Haskell and Kevin were shooting in South Dakota on the Rez, revisiting Pine Ridge and Wounded Knee. Haskell reports using the very small Sony 760 allowed him to do HD 24P shooting in tight, rough places like a pick-up truck on a washboard road. The image stabilizing control, which they call Balanced Optical Steady Shot, is a remarkable plus to a $1,500 consumer camera. Blur gets cut down and the entire optical block moves at once to maintain the optical path. Any questions, technical or about the subject matter of the new Wounded Knee shoot, use the Contact page to write to the Institute. Released for the first time as director’s cut: From Haskell Wexler, one of the most decorated and well-respected cinematographers in the movie business, comes the director’s cut of his classic, LATINO: AMERICA’S SECRET WAR IN NICARAGUA. The film is set in the context of the battle between the Sandinista government in Nicaragua and the U.S. backed Contra rebels. Eddie Guerrero (Robert Beltran) is a Vietnam vet sent to help U.S. Special Forces train the rebels. 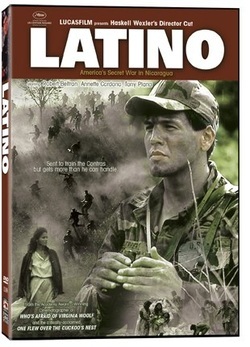 He falls for a local girl, Marlena (Annette Cardona); however, when her father is killed by the Contras, things change. Bonus Features include an hour-long interview with the legendary cinematographer on craft and politics. Latino trailer from Cinema Libre Studio on Vimeo. Uprising host Sonali Kolhatkar interviewed Haskell Wexler in studio on July 27, 2011. Haskell Wexler, founder of The Institute For Cinema Studies, visited Cerritos College to speak to Steven Hirohama’s class. The students in Steven’s class are primarily ethnic minorities, lower income and marginalized, hoping to have careers in the movie industry. Steven is documenting the progress of 5 of his students, all from 562 area code, hence the name “(562) Film” for his documentary. Haskell’s participation with these students, spending the day with them in class, was inspirational for all. One student, Edgar Alvarado, is featured in this clip from Steven Hirohama’s documentary. Be among the first to check out the feature length documentary on one of comic books’ most popular and enigmatic writers at this exclusive LA preview event! See the entire feature length documentary featuring Grant and many of his closest collaborators and friends. The film will be followed by a Q&A with Director Patrick Meaney, as well a special guest to be announced soon. 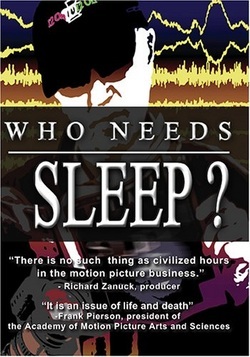 A documentary by Haskell Wexler about excessive hours for workers in film and television production. Screening to be followed by an open discussion forum with members of Toronto’s film and television production community. Be part of the discussion about how to create a healthy and sustainable work model for the film and television industry!